I was excited when I first saw ToolGuyd's post, thinking that DeWalt was looking to seriously compete with Milwaukee's "next best thing" strategy, where Gen 1, Gen 2, and probably soon Gen 3 tools are replaced/supplemented by smaller and more powerful versions. When I saw that the new Atomic tools are simply upgrades to non-premium level tools I was less than enthralled. My 996, 887, and 796 perform better than I personally need them to, but it would have been nice to see DeWalt release superior tools under such a powerful sounding name as "Atomic". I'd recommend one of two things to bring down the cost of factory batteries: a sale/promo event or buying a kit and selling the unwanted tools. I recently bought two Ridgid 9.0Ah batteries for $99 apiece, approximately half the regular price. Similarly, I built up my M12 batteries by getting the free 2.0Ah battery with various bare tools. So, I sit here surrounded by tools, with drills and saws from the likes of DeWalt, Ridgid, and Milwaukee, and niche tools and equipment from Ryobi and Ego. I'm in a field-like environment during the work day, so I just purchased the DeWalt radiant heater to complement the Ridgid jet heater, while a couple of the Ridgid fans and my portable power station sit in my room at Fort AP Hill. With the tax return I'm sorely tempted to pick up a couple of the Ridgid 9.0 batteries (for the heater and air compressor), and to look into four 12.0 Flexvolt batteries for the power station, despite having numerous batteries in both ecosystems (up to 4.0Ah in Ridgid and 9.0Ah in DeWalt, not to mention a couple of 9.0Ah M18 batteries for the Fuel tools and lights). I doubt I'll buy these large capacity batteries as there are more pressing priorities, but it's a pain being enticed by the latest and greatest batteries to ensure maximum personal convenience. At the same time, this is a great age to live in for those who actually make money using their tools (as I once did and may be doing so again in under three years). Hope everyone is doing great, it's almost time to kick off Expert Infantryman Badge testing! Not a tool, per se, but I got the DeWalt bare tool radiant heater this morning to complement the Ridgid jet heater I got a month or so ago. Currently in a field environment, so expect both to come in handy (along with the three Ridgid fans, should it get too warm). The way these new batteries are you can charge them up to full capacity, take them out of the charger and let them sit there for 6 months and they will still have charge in them to use. There's no reason to leave them in the charger after they've charged up if you're not going to be using them for a few months. This...for better or worse I've got more batteries than I know what to do with. My DeWalt 12v Max batteries sit idle for months but are ready when I need them, and some are 8 years old. My 8v Max gyro drivers see the batteries charged maybe twice a year. The packout system is nice. While mine is hardly used, I've seen two in the vehicles of contractors that looked like they've seen quite a bit of work, abd if anything they only look better with some mileage. One was in a van and the other in the bed of a truck with a Ridgid box on top of it. Incidentally, both were at nearby Home Depots. As for the work platforms, I find them to be handy tables, benches, and even supports for air mattresses, besides their normal use. I probably have ten total now, mostly Gorilla but one lone Werner. They're cheaper, sturdier, and more practical than Wal-Mart style furniture. I'm lucky insofar as having an uncommonly common name. When I search for myself I find a bunch of other English and Americans instead. As for Instagram, I may scope it out. Thanks for the info! I think I'm just a bit too old and cynical for social media, in philosophy if not in age (I'm 40). I have a Facebook but primarily use it to keep up with military friends. Otherwise, I prefer the relative anonymity and hands-off nature of forums over social media, which in my mind only feeds the habit of being constantly connected to our mobile devices these days. Even so, years ago I was a member of various Yahoo Groups, and while I fondly recall the days of participating in those discussions, they lack the nostalgia of forums such as these. I know that this site isn't going anywhere any time soon and hope to see an increase in activity. Then again, maybe I'll have more time and a more positive view of social media after retirement. Near fifteen years ago I was a member of the Living With Style (LWS) "community", a rather large site comprised of forums relating to everything from gardening to firearms to art and even to a dedicated Flames forum. In 2008 it imploded but prior to this I was a Moderator for a forum there as well as an Administrator for a couple of its upstart Zoints-connected independent sites. 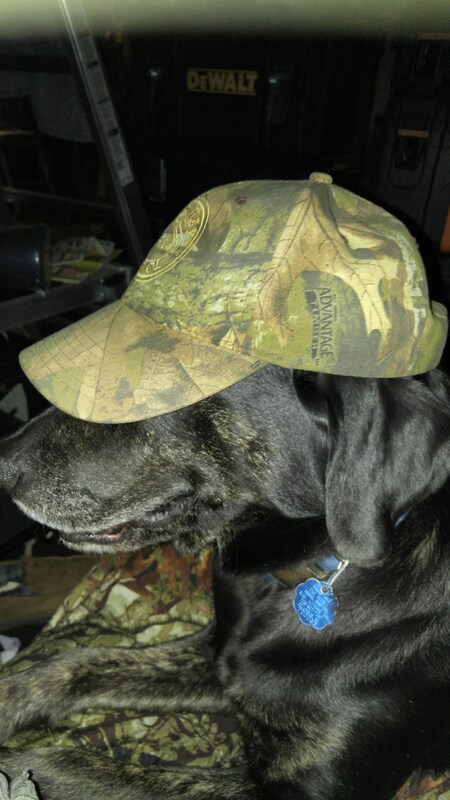 At the time I was fairly active on those sites as well as other mostly gun and truck forums. In recent months, I've noticed a decrease in activity here at the TIA forums. While a few others and I visit daily, and a few new threads/posts are made daily, formerly active sections such as this one are seeing sporadic new content at best. One thing that seems to still be a problem is spam, as evidenced by the now-deleted invasion of Chinese(?) characters and links a few days ago. Another problem are those who seem to register only to try to stir up the pot, such as a very recent comment about those who prefer a certain tool brand. Besides extremely large sites like Reddit, these smaller but much more user-friendly forums seem to be slowly fading from popularity. Is it the near-instant gratification that comes from social media (versus risking slipping under the radar if a question or comment is made here)? Anyway, I'm as guilty as anyone nowadays, checking the forums multiple times daily but contributing less than I was mere months ago. Any insight into how to attract more activity? ...and found a clearance table getting set up. A bunch of bare Bosch drills for $40, a new PC combo for $100, a Skill jigsaw for $10, and a bunch of other stuff that looked like it had been tossed in bins for displays. I ended up paying $1 for the Hitachi OMT accessory box with two wood flush cut blades, sandpaper and sandpaper adapter; and $2 for two more blades, sandpaper and adapter from an unknown brand (looks like Rockwell). As I was checking the other stuff out, an employee pointed out a box of free items. 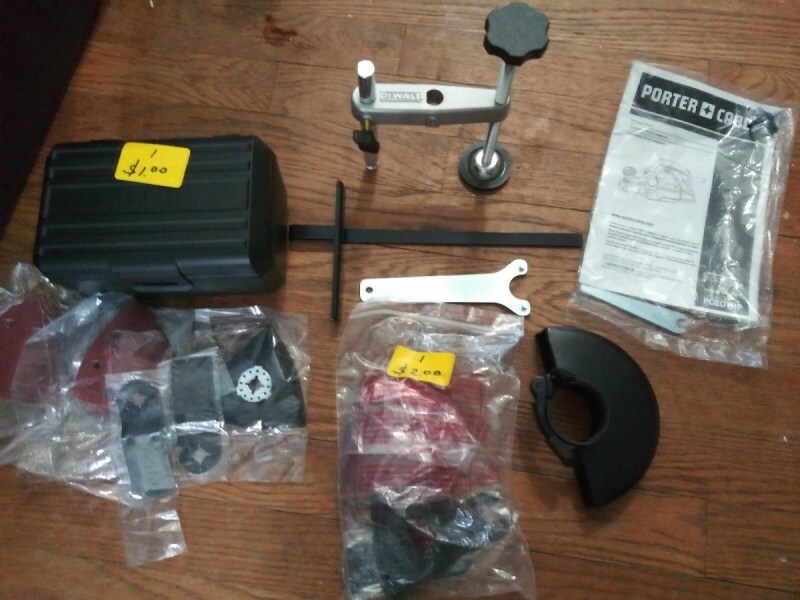 The grinder guard and wrench (hoping they work for the DeWalt and/or Ridgid cordless grinders), Porter Cable planer screw and wrench ( may be compatible with my DeWalt planets), circular saw rip fence, and DeWalt miter saw clamp all came out of that box. They had a bunch of side handles and dust bags too, but most of the stuff was Kobalt or Hitachi. Using this logic, Kobalt probably comprises 95% of power tool sales at Lowe's here in the States. Their 24v platform offers not only "20-25% more power" but also much cheaper batteries. It is too bad for DeWALT that they must build / distribute / inventory two almost identical parts, different only by label and model number, only because of marketing considerations. Those complications increase cost / reduce profit. Those company costs ripple down to impact consumers. I doubt it costs a prohibitive amount, especially since DeWalt usually has much better prices than Milwaukee (at least in the US). I suppose it's not too dissimilar from car makers rebadging a foreign model. Sitting here enjoying the snow in the DC area. While the accumulation so far is miniscule compared to that usually encountered further north, I'm comforted to know that in a pinch I can keep my phone and tablets charged with DeWalt, Ridgid, or M12 batteries, power small items with the DeWalt power station, generate some heat with the Ridgid forced air heater, run the ToughSystem radio for entertainment, light up the house with the various DeWalt and Milwaukee lights, and warm up with the M12 heated gear if needed. I don't expect a power outage--or even missed time at work--but days like this it's nice to know I have a few day's worth of backup energy for such conveniences. Does anyone else find confort knowing that being a "tool guy" makes you just a little better prepared for a short duration emergency? Do they no longer make Kobalt? What type and brands of clamps do you all prefer? I picked up four more Bessey GSCC clamps this morning, 36" this time since I mostly have 6" and 12". Those seem decent for the price, though I also like the Irwin and DeWalt trigger clamps. Nice setup, I haven't used kaizen foam either, but need to get some to set up the myriad modular boxes with. The 20v Max OMT is great! I bought one for the free 6.0Ah XR battery promo last year, then got a little used kit my wife bought for a project. I used to have the PC 18v version which was useful but nowhere near as refined. I actually brought my DCF887 into work today to let a coworker use it, only to find out she no longer needs it. I lucked out and got mine in a kit with two 2Ah batteries for $90 after it was returned. Impact drivers are great, aren't they! My first was part of my first Li-Ion kit, an 18v Porter Cable. That and the 12v PC impact were given away along with the rest of those platform. I also gave away a Hitachi I had. Currently, I have the Ridgid, DCD886 and 887, and two M18 Fuel One Key impact drivers. The DeWalt remain the most used. Picked up the Ridgid hybrid forced air heater since a local HD had it in stock. The DeWalt at Lowe's tempted me, but I like having the option of plugging it in, and the LSA doesn't hurt. Just picked one up this morning but need a tank for it. I have four propane tanks but I think they are in storage out of state. The hybrid feature sold me on this over the DeWalt my local Lowe's has.